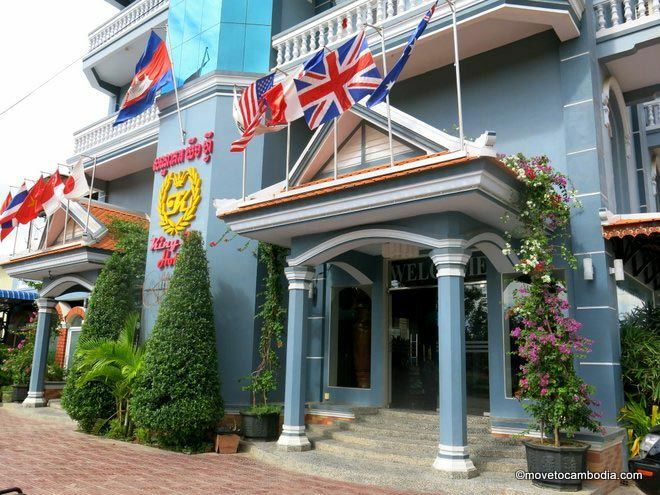 This Khmer-style hotel offers good value for money and friendly staff just across the river. Battambang’s King Fy Hotel is an eyeful. 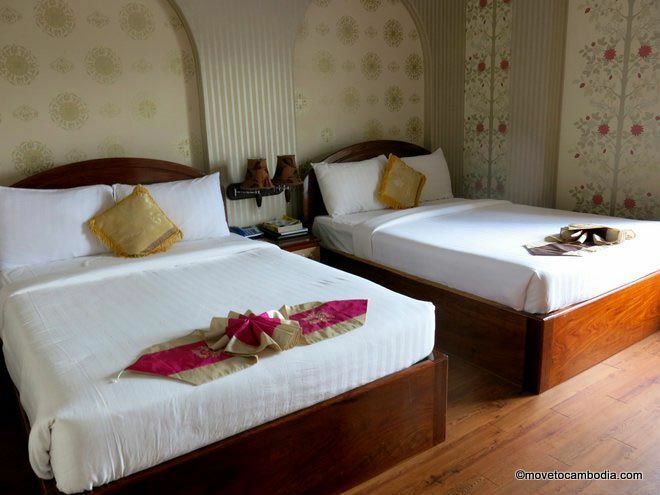 Another entry in our “new-build Asian hotels in Battambang” category is the King Fy Hotel. It offers good value for money, as well as a sense of Asian opulence in the form of extensive wooden carvings in the lobby, evoking the Cambodian woodlands that have been nearly obliterated in the last ten years. The rooms are decorated in a style that can only be called “Asian chic,” and we counted no less that four different wallpaper designs in one room. Lest you imagine a place resembling your crazy aunt’s apartment, be assured that the multiple wallpapers are clearly a deliberate design choice and sort of go together in a way reminiscent of the packaging of certain brands of Korean accessories. Three wallpaper designs and counting. Rooms go for $25 for a standard, $35 for a deluxe, $49 for a king suite with river view and $79 for a family suite. The more expensive the room, the heavier and more intricate the carvings on the wooden beds. The $25 beds are simple enough, but by the time you get to a $49 room you’ll find massive headboards carved with garlands and nagas. All of the rooms at the King Fy Hotel have LCD TVs, air-conditioning, mini-bars, hot water, and electronic safes. They’ve got a small covered pool which is surrounded by murals of running water, presumably to make the pool look bigger. The King Fy also features a room with a snooker table and ping-pong table for guests. But when all is said and done, the King Fy Hotel has incredibly friendly staff, the rooms are spotless and they get excellent reviews on several sites. In terms of value, this is a relatively high-end hotel for the the prices they are charging and all rooms include breakfast. Rooms on Agoda are similarly priced, although the less expensive rooms may be priced slightly higher and the deluxe and higher rooms are cheaper on Agoda than the walk-in rates, and they often have specials. Check prices and book a room at King Fy Hotel on Agoda now.